This document describes how to install and configure TextPad for use with Cygwin on a Windows home computer for the course CS-11: Introduction to Programming Concepts and Methodology, C++. TextPad is already installed on CTC and lab machines under the CIS and CS directory. You can download a copy of TextPad for evaluation at home as well. There is no charge for the download, but you must pay for the software if you decide to keep it. A single user license costs only $27 US dollars. Your instructor is a licensed user. Note that TextPad only runs on computers using Windows. Usually both Linux and OS X (Apple) systems have good text editors already installed. If you need more help, you can consult TextPad's Support information. Or better yet, ask a classmate if they were able to get it set up. These instructions assume that you have already installed Cygwin as described in the document How to Install Cygwin or How to Install Cygwin Using Babun. If you have not installed Cygwin, do so now. Download TextPad and install it following the Installation Instructions. Note that there are TextPad versions 4 through 8 and these instructions have been tested on to version 7. Install the bit-size (64 or 32) of TextPad that matches your computer. 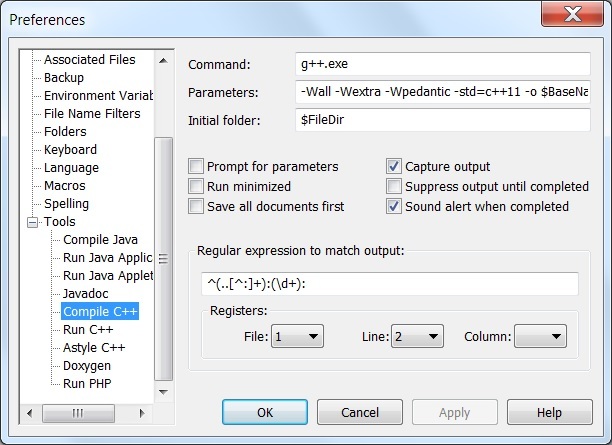 Once the installation is complete, you should configure TextPad as described below. Completing the following steps will make your programming easier. You should have TextPad add a blank line to the end of every file to prevent the warning, "No newline at end of file", when you compile a program. Click on the Configure menu and then Preferences. The Preferences dialog appears with a tree on the left side. Press either the Apply or OK buttons. You should enable line numbers so you can more easily find errors reported by the compiler. You need to configure tab settings so that your source code files are correctly formatted and you do not loose style points on assignments. Expand the Documents Classes by clicking on the '+' sign. On the right side there should be two checkboxes labeled "Convert new tabs to spaces" and "Convert existing tabs to spaces when saving"; check both of the checkboxes. You need to enable syntax highlighting so that your source code files are display in color for keywords and strings. On the right side, check the "Enable syntax highlighting" checkbox. In the "Syntax definition file" drop down list, select "cpp.syn". To configure Notepad++ to compile C++ using Cygwin, you must add the Cygwin bin directory to your computer's PATH environment variable. The PATH variable stores the directories where executable code is located. Caution: Setting the path on Windows is a potentially dangerous operation and could temporarily disable your computer if done incorrectly. If you follow these instructions carefully, you and your computer will be fine. If this warning makes you too nervous, then get someone to double-check you as you perform these steps. For Babun Cygwin, the username is the login name for your computer. In the Search field, type System and select System from the list. If more than one System appears, select the one related to Control Panel. Windows 10: Open the Control Panel, click System and Security and then click System. For more help search for Windows System Properties. Open the System Properties dialog by clicking on the Advanced system settings link. In the System Properties dialog, click the Environment Variables button. 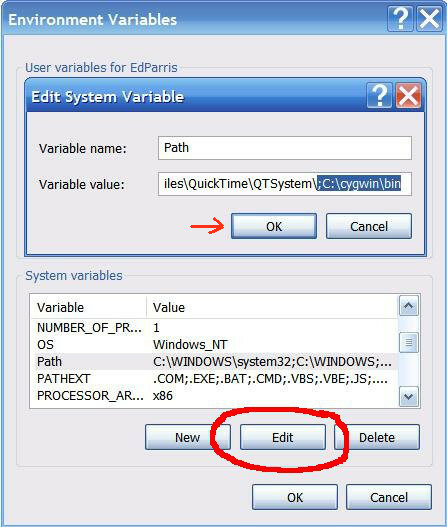 In the Environment Variables dialog locate the Systems Variables section (bottom half), scroll through the list and highlight the Path variable, and then click the Edit button. You will see the Edit environment variable dialog or, on older Windows, the Edit System Variable dialog shown below. In the Environment Variables dialog, press the New button. You will see the Edit environment variable dialog shown below. Enter the path to Cygwin from step 1 and press OK. Note that you must separate each path with a semicolon like the set of paths shown above. Do NOT copy the entire path above. Instead, to the end of the list, add a semicolon followed by the path from step 1. After adding the path, press the OK button in the Edit System Variable dialog as shown by the arrow below. After you have set the path, you can set up TextPad to compile programs. Click on the Tools node of the tree. You will see a Tools dialog with an Add drop-down menu. The Select a file dialog appears. Browse to the folder in which you installed Cygwin and open the bin directory, select the g++.exe file and press the Open button. G++ should now appear as a choice in the Tools tree. Expand the Tools tree and click on the G++ tool. Make sure the Command text field is like the one shown. Check the checkboxes as shown. Set the Registers as shown. Note: do NOT click on the G++ label under Tools on the left side. 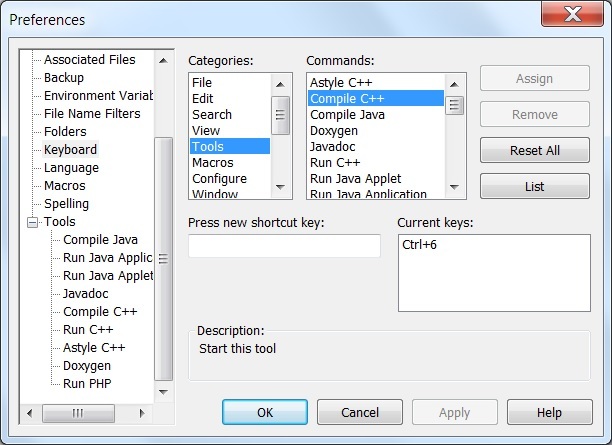 You can now compile C++ programs by selecting Compile C++ from the Tools menu. You can test the configuration by saving the following program as hello.cpp and then compiling. Verify that the file hello.exe is created when you compile. Press the Apply button in the Preferences dialog. cmd.exe should now appear as a choice in the Tools tree. Rename the cmd.exe to Run C++ by clicking on the Tools node of the tree and then double-clicking on the cmd.exe tool. Expand the Tools tree and click on the Run C++ tool. Uncheck the Capture Output checkbox. 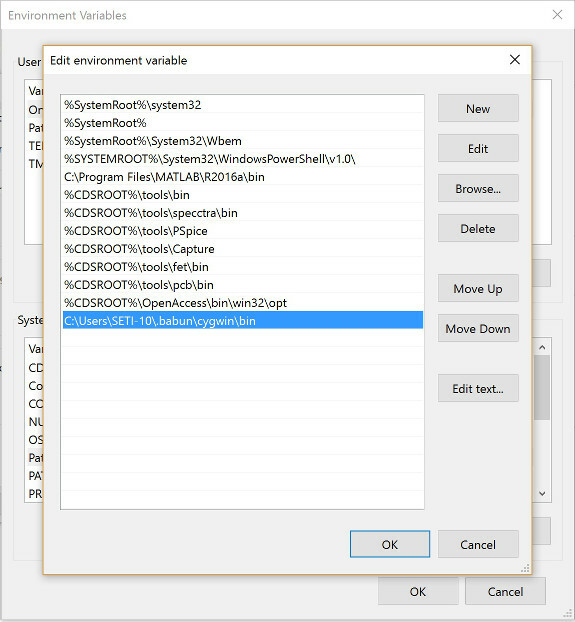 You can now run C++ programs by selecting Run C++ from the Tools menu. Remember that you must compile the program before you try to run it. Browse to the Cygwin bin directory (C:\cygwin\bin), select the astyle.exe file and press the Open button. Astyle should now appear as a choice in the Tools tree. Expand the Tools tree and click on the Astyle tool. Make sure both the Capture output and Sound alert when completed options are checked. You can now automatically style your code by selecting Astyle from the tools menu. Download the following files and save them anywhere in your system path. I suggest that you save them in your Cygwin directory: C:\cygwin\bin. From TextPad's Configure menu, choose Preferences. Browse to the bin directory of where you saved doxygen.exe, select the doxygen.exe file and press the Open button. Doxygen should now appear as a choice in the Tools menu. Expand the Tools menu and click on the Doxygen tool. If you saved the files somewhere else, you will need to change the path shown above. * The hello.cpp program for checking Doxygen. * The main method for the application. Copy the above program to the new document page of TextPad. From the File menu, choose Save and save the file using the name hello.cpp to a convenient location like the Desktop. From the Tools menu, choose Doxygen. If there are no errors or warnings, you will return to the file document: hello.cpp. If there are errors or warnings, you will see a list of them in the Command Results page of TextPad. On the Desktop, double click the html folder and find the file named: index.html. double-click the index.html file to open it in a web browser and view the generated documentation. Click on the Keyboard node of the tree. You will see Categories and Commands as shown below. Select the Tools category from the list, and the tools commands will be displayed. Select the Tools command you wish to set a shortcut for. Type the keyboard shortcut combination in the "Press new shortcut key" box. Typically, tools are two key combinations using the Ctrl key and a number. Click the Assign button to set the shortcut. After assigning all the keyboard shortcuts, press the OK button.